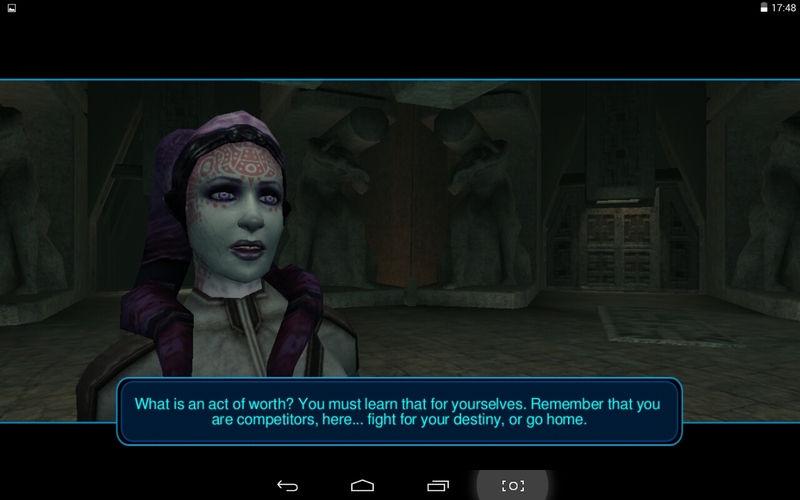 So: One planet left to go in my quest for the Star Forge, and it's Korriban. I intentionally left that one for last because the home of the Sith didn't strike me as the most welcoming place to visit as a freshly minted Jedi Padawan. Plus there was also that guy who warned me about Terantateks on Korriban and that they were very deadly. 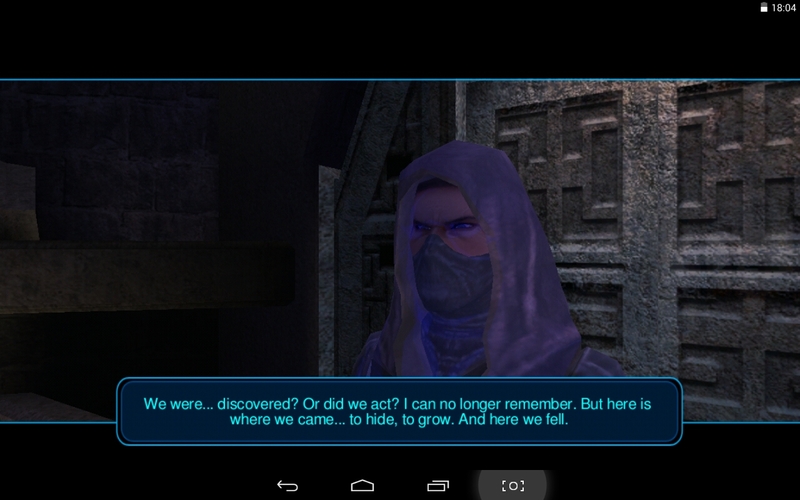 Korriban was immediately both fascinating and confusing to me because it just felt so different. I get that KOTOR is meant to take place about three hundred years before the events of SWTOR, but in the Star Wars universe changes generally seem to happen at a glacial pace, and at least the Jedi seemed largely the same in their ways, except for the rank of Padawan being a bit more prestigious than I'm used to. But the Sith were confusing to me from the start, because the first "Sith soldiers" you run into on the Endar Spire are clad in full metal body suits with faceless masks that make them look like metallic ninjas - quite scary to behold to be honest, but apparently none of them were actual Sith - they were simply regular ground troops. The Sith at the Academy on the other hand all appeared to be wearing what looked to me like ordinary Imperial uniforms, which is a complete inversion of what I'm used to from SWTOR. The whole atmosphere is different as well - while the Sith code gets recited, there are actually people crowding the Academy, trying to get in as if it was some kind of elite university, and it's stated repeatedly that people are free to leave if they don't like it. Everything's almost... normal, which is what makes it so strange. The Sith Academy in SWTOR is a place where everyone wears dark robes, and an elderly overseer casually asks you to slay some monster around the corner, extract its skull and bathe it in blood to have your future divined (yes, this is an actual quest). 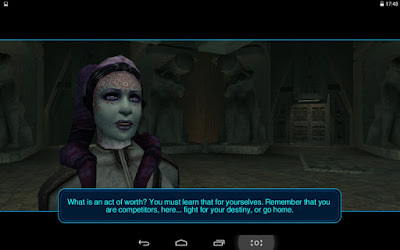 In the Sith Academy in KOTOR, a tatooed purple Twi'lek calmly lectures you about the ways in which the Sith are superior to the Jedi, and your fellow trainees come across as spoilt frat boys more often than not, which is a stark contrast to the desperate souls fighting for their very lives every step of the way on SWTOR's Korriban. Either way I was off to a great start when I ran into a young Sith tormenting failed applicants in public, asking me to choose one nasty "punishment" for them over the other. I asked him to let them go, and explained that he should listen to me because I'm Darth Revan. This resulted in him having a laughing fit and letting me have my way because I was so hilarious. Hmm. On this planet, getting to the star map fragment involves passing through the Sith Academy, so you have to sign yourself up as a fallen Jedi. (There is, again, the option to just say that you're Revan and they should let you get on with it, but I'm not sure if that ever works - maybe if you're sufficiently dark side.) Inside, the Academy does evoke the same familiar feelings of an uncomfortable environment that I'm used to - a training room is dedicated to killing slaves and in an interrogation room you can torment a captured Mandalorian. I decided to pass on both. While there was also an option to try to help/free them, that didn't strike me as the best idea when I'd only just started trying to pass as a Sith. Fortunately there were some more inoffensive options to gain some respect and XP: I killed a beastie in some nearby caves and helped a group of runaway students escape, then went on to plunder several Sith tombs. 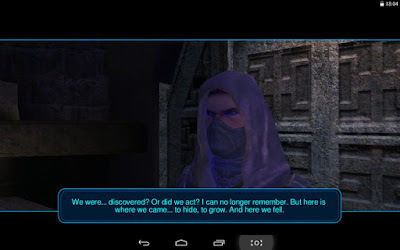 I'm surprised they had anything left in there to plunder by the time the events of SWTOR take place! I loved running into the crazed former head of the Academy there, who apparently decided to set up shop in one of the tombs and captured students for his insane amusement. Now that's what I consider proper Sith behaviour. Meeting the ghost of Ajunta Pall was interesting as well - I'd only ever read his name in context of all the evil he did, but his spirit was - unlike any of the spirits I met in SWTOR - very sad and full of regret. Once you've gained enough prestige to have earned the head of the Academy's respect, he will get you ready for your final trial, which lies in the tomb of Naga Sadow. That place was no joke! It even made me play a round of Towers of Hanoi, and the system there was so unforgiving that two mistakes in a row would cause the ceiling to collapse and kill you. There was also a room with not one but two Terentateks in it, and I was super proud that I managed to best them on my first try, though it was touch and go and I was certainly on the edge of my seat throughout. Once you've passed your trial and found the star map hidden in the tomb, the head and your overseer both show up to congratulate you, just to immediately get into an amusing game of trying to betray each other at the same time. You get to choose who you want to side with (if at all), and I chose to help the purple Twi'lek lady who had been training me, though as soon as we were done she wanted to kill me too. This is the Sith Empire's biggest problem: Survival of the fittest sounds nice in theory, but they just never know when to stop. I decided to be merciful, let her go, and then got the hell out of there. 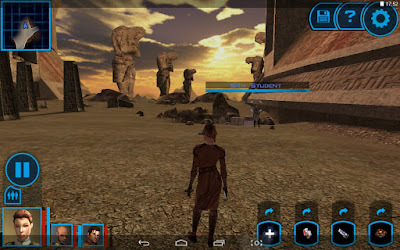 All in all, Korriban was another planet that I really enjoyed. My only major disappointment with it was that I had stumbled across a mention of Carth having a companion quest there, in which it turns out that his son isn't really dead but has joined the Sith. Since I quite like Carth I wanted to do that of course, so I explored every nook and cranny of the area but found neither hide nor hair of the boy. So I checked a guide... and unfortunately, this quest only becomes available if you previously had Carth out at a certain time and in the right location back on Kashyyyk, which of course I hadn't, and you can't go back to unlock it later either. Siiigh. Either way, it should be time for the big showdown soon.